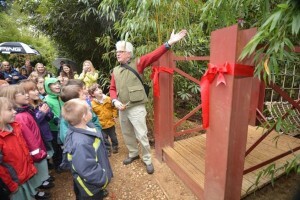 The year 2015 corresponds near enough to the 250th year that the walled garden at Abbotsbury was conceived. It was built for Elizabeth Fox Strangways, the 1st Countess of Ilchester, primarily as a sheltered kitchen garden where espaliered fruit trees were grown on the walls and vegetables were harvested for the family home known as Abbotsbury castle that stood on a bluff of land overlooking Chesil beach just a short distance from where the gardens are today. In order to celebrate this remarkable achievement of longevity we have had a special beer brewed by a local microbrewery ‘Gyle 59’ . We searched for an added ingredient that could add a spice or hint of flavouring from plants that were growing in the garden. One plant that seemed a likely candidate was Tasmannia lanceolata or ‘Mountain pepper’. It is a shrub native to woodlands and cool temperate rainforest of south-eastern Australia and grows well in our woodland. The first brew nearly blew your head off as it was very strong but Gyle 59 did a great job on the second attempt and we now have a beer with a very distinct spicy taste and not too strong at alc.3.7% vol. 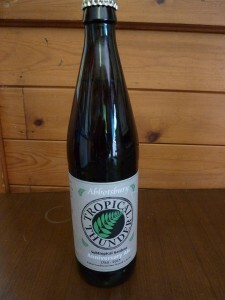 The second phase was to start a competition open to our regulars on facebook to come up with a name for the beer. 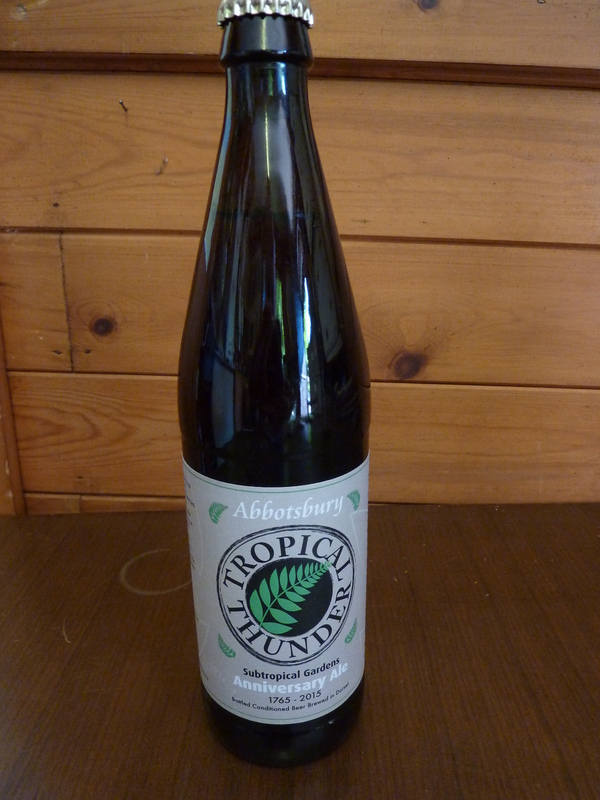 The final name was selected as “Tropical Thunder” and a green leaf logo on the bottle has added the final touch. I must manage my time better and not commit to more projects, words that echo in my head but the trouble with creative gardening is that there are never ending options and developments to pursue and no sooner have I seen off one new landscape development along comes another. 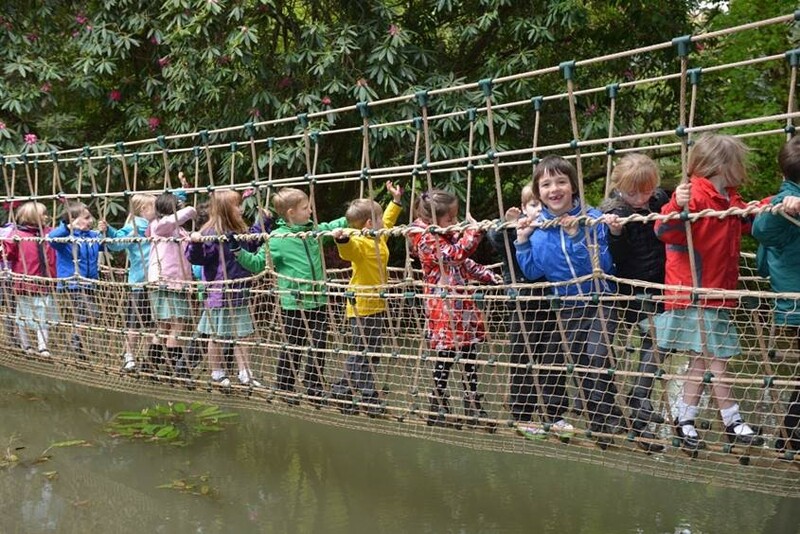 The new ‘Burma rope bridge’ was built early in the year and has seen constant use ever since, making a nice addition to the Jurassic swamp garden at the bottom of the valley. We planted new plants that were sourced from various nurseries that had plants with a provenance from the Myanmar region of the eastern Himalayas, many that I had seen in the wild on my trek to ‘Phongon Razi’ on the Burma Indian border back in November 2014. There are many plants I had seen in Myanmar that were originally written up in the journals of Frank Kingdom Ward who travelled extensively in this region in 1920. Having also trekked on jungle trails and over steep gorges high above fast flowing tributary rivers of the Irrawaddy it is fun trying to replicate or mimic a little part of that journey. 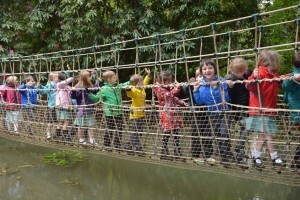 ‘The Jungle book’ to inspire the children of Portesham primary school who then proceeded across the pond along the rope bridge with lots of enthusiasm and exited chatter. In July the gardens also held a Barn dance in the tea garden of the Old Colonial Restaurant which was well attended by holiday makers and staff. The band were the ‘Black Sheep’ who really livened up the evening with some great fiddle tunes and the caller managed to get everyone together on the dance floor. 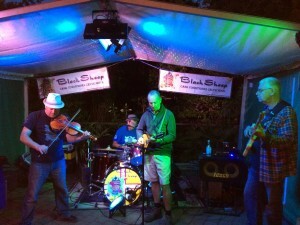 Black Sheep band and mystery Mandolin player ! In August we held a garden fair with various activities all taking place on west lawn. There was a face painter, a rock climbing wall, a giant bouncy castle, an artist caricaturist and taking center stage was the ferret racing which was great fun for children and adults alike. Another project successfully started this year are the Hydrangea Trials in the gardens. 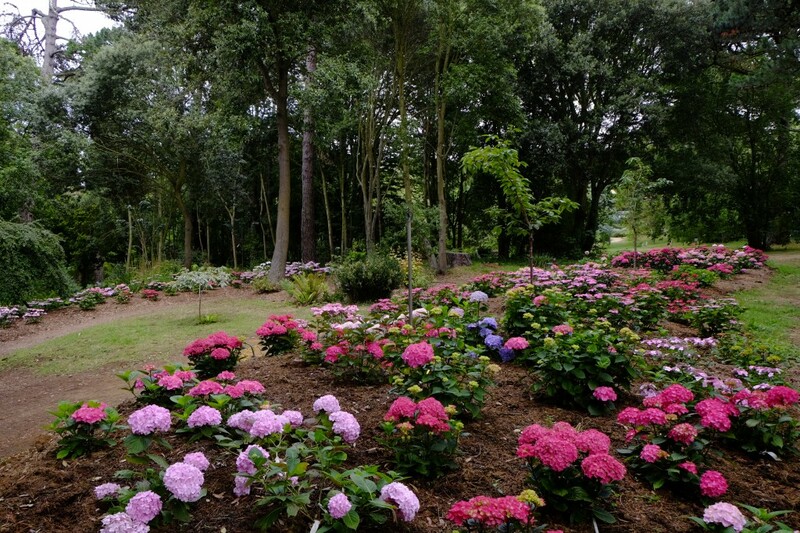 We have planted up the Hydrangeas in the woodland behind what was once the sculpture trail, making an unused area into a colourful shrubbery. 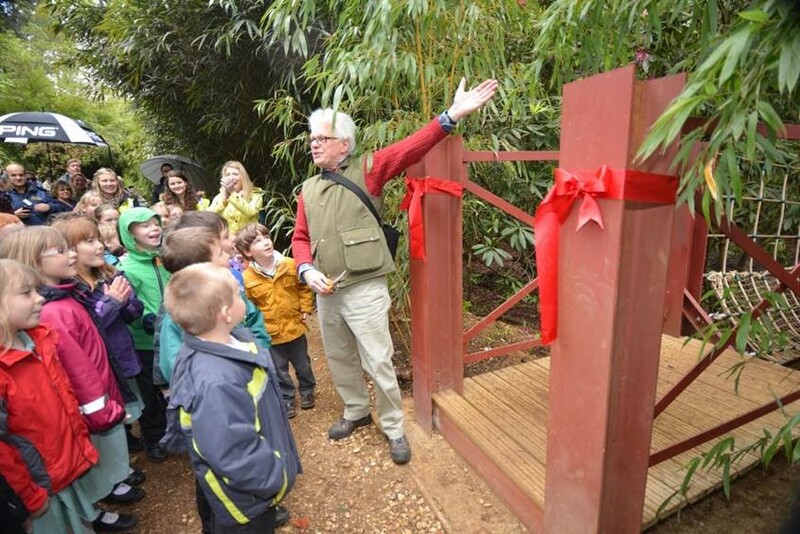 The Royal horticultural society has been running plant trials for many years but has recently decided to extend trials to new sites and gardens other than just at their headquarters at Wisley. The idea is to grow and monitor selected new cultivars over a period of 3 years, to check their vigour, disease resistance, flower colours and growth habit. I am joining the panel of experts that include site visits to Saville gardens in Winsor Great Park who are also growing a trial but growing on soils that are more acid than ours which will show a greater concentration of blue flowers. 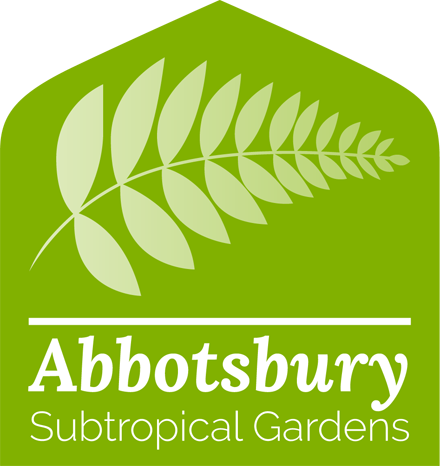 We will meet twice a year to take notes and the outcome will be that selected plants will be given an AGM (Award of garden merit) which then will help the nursery trade in potential sales and provide public information.